Another Side: Katie Fite Goes After "Public Lands" Ranchers — Repost by Iwusthe Driver, Editorial Assistant | RANGEfire! NOTE: In the West, there is an old saying to the effect that: “good fences make good neighbors.” At RANGEfire! we acknowledge our virtual neighbors on this virtual landscape, We acknowledge that there are always multiple sides to every story. Like many environmental activists, Katie Fite is highly critical of Western ranchers, and the ranching industry. We think it is important for people to have an opportunity to hear all sides of the story, and know what others are saying about these issues. So we often share what others are saying. 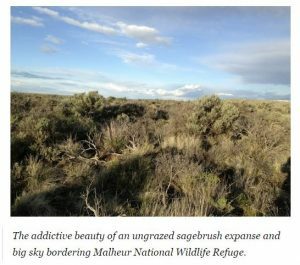 According to Fite, the beauty of ungrazed sagebrush is more addictive than the beauty of grazed sage brush. But there is an old saying that beauty is in the eye of the beholder. According to Katie Fite, “throughout the Ammon Bundy and militia thug seizure of Malheur National Wildlife Refuge, the media failed to report on the modern day filthy rich cattle barons of Harney County and beyond. Articles rarely if ever contain an environmental voice. Yet there have been endless interviews of carping ranchers claiming oppression by the federal government. An Oregon Public Broadcasting story on taxpayer subsidies to cattlemen included a Harney County ranch manager griping about federal government over-reach. “Harney County locals may not like the militants’ tactics, but the prospect of more local control over public lands continues to have appeal. Ranchers say their tension with government is born from rules and restrictions driven by “radical environmental groups,” and the frustration of dealing with a plodding bureaucracy that drives up costs and undermines their economic security. Just who are these embattled ranchers, reeling from the heavy-handed tactics and oh-so-restrictive grazing policies of the BLM ? Fancy “Treetop Ranch” signs have sprung up on huge spreads across eastern Oregon and portions of Idaho in recent years. Larry and Marianne Williams control Treetop Ranches, and their cattle herds impact a vast area of crucial sage-grouse habitat across eastern Oregon and portions of Idaho. “Mr. Williams had sold his company, Idaho Timber, and shifted into the cattle business primarily in Idaho and Oregon. He also maintains a very successful thorough-bred horse-racing program near Parma, Idaho. In 2012, William’s Horse Racing Nation’s “Rousing Sermon” finished eighth in the Kentucky Derby”. to each other, stretching about 150 miles long and 100 miles wide with other ranches interspersed among our properties,” Anderson said”. Yes, three quarters of a million acres – largely BLM public land plus large state and private holdings. Treetop controls ranches near Burns, at Oregon Canyon north of Mcdermitt, and across the “big empty” sagebrush sea of the region. Vast BLM grazing permits including crucial sage-grouse habitats and wilderness study areas are under the hooves of this operation. Treetop also raises race horses, based in Parma, Idaho. “For the last 13 years, Kiser has managed the horses owned by Larry and Marianne Williams. Kiser lives and works at the ranch and is in charge of about 100 horses”. There is no information on the fate of horses bred for racing that do not “make the cut”, a matter of increasing concern to animal welfare advocates opposed to horse slaughter. Treetop shows up in Burns area agency meeting records as involved in NRCS projects. Woody vegetation is often killed in these taxpayer-subsidized projects to produce grass (cattle forage), with under the guise of helping sage-grouse. The Williams’ operation is only one of a large number of immensely subsidized wealthy public lands welfare ranchers that are increasingly common in Harney County, Malheur County and the rest of the West. Rich ranchers now wield immense power over western public lands. Ammon Bundy is not only defending their god-given right to reap immense profits from the public domain – unshackled by repressive BLM regulations – he wants to hand Our land over to these folks. The Roaring Springs Ranch and its Ranch Manager Stacy Davies have been featured in many stories glorifying the benevolence of cattle grazing in the Oregon High Desert. It is a common practice for ranch managers to proselytize for the wealthy ranch owner and the beef industry. They put a pretty face on public lands welfare ranching. Davies ardently promotes “grass fed beef” and subsidized taxpayer-funded clear cutting of western juniper, and other federal handouts. The Roaring Springs Ranch was purchased in 1992 by the Sanders family, timber mill barons from west of the Cascades. The ranchwebpage shows this family still holding the ranch. “Roaring Springs Ranch was purchased in 1992 by the Bob and Jane Sanders and Rob and Carla Sanders families. They have operated the ranch as a cow/calf-stocker operation, which sustains more than 6,200 head cow/calves, 150 horses, and harvests 2,500 acres of meadow hay and 1,200 acres of alfalfa. Roaring Springs Ranch’s operations utilize a total of 1,011,792 acres of diverse lands, including 249,798 deeded acres, 735,359 acres lease from the Bureau of Land Management, 22,000 acres of private leases, and 4,640 leased from the State of Oregon”. The timber mogul’s vacation retreat Ranch has been “paying its own way” — by sucking in large government subsidies over the years – on top of the near-free public lands grazing fees. Projects related to perpetuating high levels of grazing have been subsidized by the federal government and other agencies – first under the guise of watersheds and redband trout protections in the 1990s, and now it appears sage-grouse. “The government will spend about $300,000 over the next five years on such things as fencing to control cattle and fish passage improvements. Roaring Springs will contribute labor, equipment and supplies worth about $50,000. The nearby Malheur National Wildlife Refuge will allow Roaring Springs some grazing space to take pressure off the recovering creeks”. “SDA chief Tom Vilsack has announced a $211 million boost to the Sage Grouse Initiative. Oregon ranchers say greater sage grouse collaboration with federal agencies is paying off”. Yes, indeed. What rancher doesn’t love the federal government doling out forage projects paid for by various agency sage-grouse slush funds unlimited dollars? The funds are used to clear trees (and sage, too, often as collateral damage), to increase cattle forage grasses, to build even more fences lethal to grouse, or to purchase conservation easements that don’t limit grazing. Cheatgrass, medusahead and other weeds increasingly spring up in the wake of these projects. So agencies conduct taxpayer-subsidized herbicide campaigns. Juniper killing on BLM public lands is a massive subsidy from federal fire, sage-grouse project, or other funds. One of the multi-agency groups associated with these projects is called, fittingly, Sagecon. Many public lands welfare ranchers, including Roaring Springs, signed CCAAs (Candidate Conservation Agreements with Assurances) to shield their grazing damage from an ESA listing. The agreements are “enforced” by Harney County. Rancher clout has resulted in “liberal” Oregon exempting agreement information from Records Act requests. . And at the federal level, provisions of the Farm Bill limit NRCS from disclosing who are the private landowners and ranchers receiving grouse welfare. At a sage-grouse Owyhee juniper killing planning meeting in Idaho, I asked an NRCS manager about a particularly egregious fencing project. She replied that she could only confirm that NRCS had not funded a particular project. She could not disclose who was receiving funding. This, of course, serves to shield wealthy ranchers from subsidy scrutiny. The Roaring Springs cattle barons have their own biologist, apparently tasked with putting a positive spin on livestock damage, promoting images of thriving grouse populations, and pushing back against stronger protections for grouse habitat. “ … wildlife biologist at Roaring Springs Ranch, said the 3 percent disturbance cap was based on data that isn’t applicable to Oregon, and he urged ODFW (and later LCDC) to analyze Oregon’s leks to gather more applicable data”. This 3% “cap” actually allows new development to pierce undisturbed grouse habitat, up to 3% of the ground surface every section or so. (Sage-grouse really can’t tolerate any new disturbance to their dwindling habitats). The ranch biologist objected to this weak control that limits areas of bladed off bare dirt and/or acres covered with buildings or mine pits. Under the BLM Plans, due to the clout of the cattlemen, grazing does not count as a “disturbance”. The BLM plans are an epic fail in controlling grazing damage to sage-grouse habitats. A BLM grazing permit renewal document shows just how immense some of the Roaring Springs BLM permits are. So instead of the rich rancher herds being lighter on the land, the same grass greed mentality prevails. The grazing decision refers to a massive federally funded BLM western juniper clearcutting and burning project, the controversial “North Steens Ecosystem Restoration Project”. This project is wreaking havoc on migratory songbird and other wildlife habitat in the disappearing western juniper forests of the Steens. Massive taxpayer fudned deforestation is taking place across the region – like a horrifying project that Chris Zinda just wrote about to convert often ancient western juniper to fuel for the military by Lakeview, Oregon. Ranch Manager Davies is the spokesman for the grass fed welfare ranching “natural” beef consortium. He has also been an outspoken critic of wild horses as competitors for forage coveted by the wealthy ranch on BLM public lands. Citing the imbalance between subsidized cattle grazing and wild horses on Oregon BLM lands, wild horse advocacy groups this winter called on Whole Foods to drop sale of “grass fed” beef in the wake of the Beattys Butte round up. The beef consortium includes Roaring Springs. “Several members of the Grazing Association supply beef to Country Natural Beef, a Burns, Ore. supplier to Whole Foods. These ranches include Roaring Springs Ranch, the Fitzgerald Group, Fitzgerald Ranch and Otley Brothers Ranch. Stacy Davies, the head of the Beatys Butte Grazing Association is also the marketing director for Country Natural Beef (CNB) …”. The Roaring Springs Ranch Sanders cattle barons, like the Treetop Ranch Williams cattle barons, have an immense ecological footprint across the high desert sagebrush sea that affects the well-being of public lands, waters, and wildlife habitats. Their herds impact sage-grouse, rare trout and biodiversity in stunning high desert landscapes to a disproportionate degree. Their cattle are part of a “climate disaster”. Finally, after years of deafening silence in media, the damaging impact of “grass fed beef” grazing, in the context of climate change, is garnering new attention. Greg Walden and other politicians drone on and on about the heavy-handed, dirty dealing BLM – and incessantly interfere in federal agency management of public lands, taking the side of the livestock industry. It’s time media report on the powerful moneyed interests that reap the benefits of near-free grazing on the public domain, and the benefits of political meddling. Reporting on Malheur Refuge has taken at face value rancher and Ammon Bundy complaints about Malheur Refuge blocking cattle grazing. In fact, large areas of the Refuge are grazed, under winter hay rake grazing, or what the refuge plan terms “highly prescriptive” summer grazing. Hay is also cut and removed by Harney ranchers under various leases.